Spice up your chocolate browns and charcoal greys by introducing golden tones. 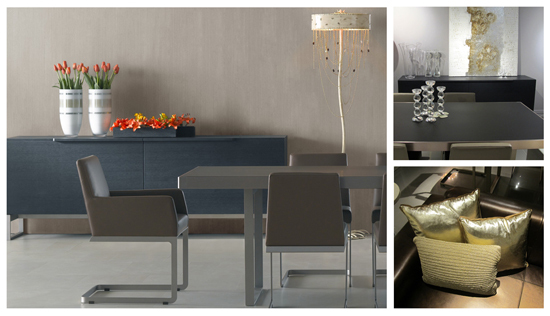 The new range of dining tables and chairs at Beyond Furniture feature a new champagne and roseate gold aluminium. This new material works well with earthy colour palettes, adding a warm, sophisticated edge. To create a luxurious look, mix textures like leather upholstery, roseate gold aluminium and frosted brown glass. These material and colour combinations are timeless and versatile, working with existing timber or polyurethane furniture. Introducing gold tones into a space can be done subtly through accessories, cushions and display objects or on a larger scale through rugs and artworks to create impact. Best teamed with neutrals and greys, warm golden tones can take an ordinary room and make it come alive. The rich combination of these colours adds warmth to a room yet the reflective nature of gold tones allows light to brighten the space. It’s easy to get carried away but the key is to use touches of golden tones, it make’s all the difference.